A unique architecturally designed tropical home built to take advantage of the sea breezes and stunning ocean views. Located in beautiful Hydeaway Bay overlooking Gloucester Island, this home is perfectly designed for the climate with high cathedral ceilings, open plan living and a vast balcony that takes in magnificent 180-degree sea views and the Whitsunday Island breeze. The Lorikeets will give you a resounding welcome to this coastal haven with its three bedrooms, 2 bathrooms, open planned living fully equipped entertainers kitchen, landscaped waterfall pool and breathtaking views. Ideally located for great fishing, exploring the surrounding islands, secluded beaches and underwater marine life of the magnificent coral reefs at your doorstep. This stunning home with it's wonderful ambience oozes relaxation and is fully equipped including undercover parking for cars and boat and an outdoor BBQ area with al-fresco reef view dining. Pool: In-ground, Deck, BBQ, Sea views, Modern entertainers kitchen with dishwasher, fridge with ice dispenser, Nespresso coffee machine, Satellite TV and DVD. Linen Hire (available on request at time of booking at $20 per person). 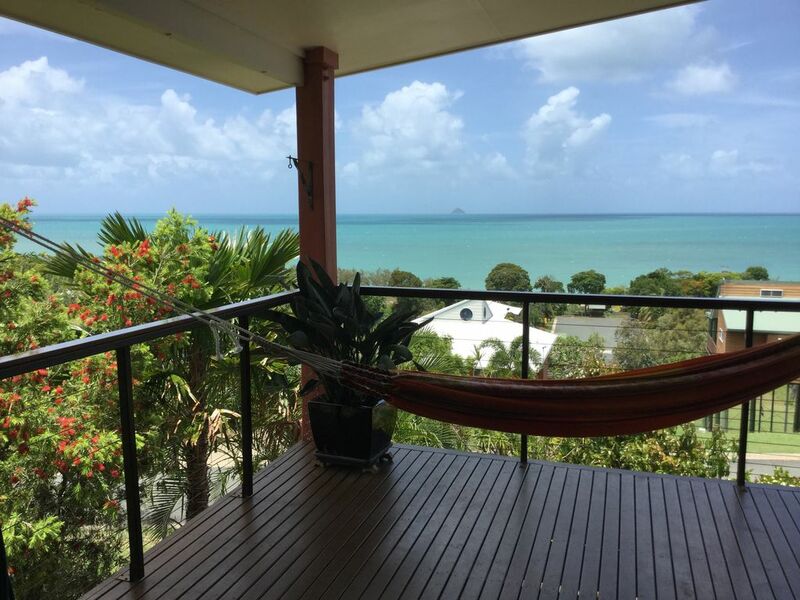 A car is required for this property located 30 min from Proserpine and 45 min from Airlie Beach. Deposit Required: 25% non-refundable deposit, remainder due: 30 days prior to arrival. Bond Required. Advertised tariff is based on Low Season Rate for 2 guests. *Add $25 per person per night for each additional guest. SORRY THAT WE CANNOT ALLOW BUCKS PARTIES, HENS NIGHTS, WEDDINGS, PARTIES OR FUNCTIONS OF ANY KIND AT THE PROPERTY. Our nearby caretaker will cater to any concerns you may have with the property during your stay. Thank you for taking the time to submit your review, it is greatly appreciated. I'm really pleased that you and your friends found the house comfortable, clean and enjoyable for your stay and look forward to your return visit. Hi Andrew, thank you for leaving your review, it is greatly appreciated. We look forward to having you stay again. This is an amazing house with a great view. We were looking for some where to relax and get away from the world after a busy year and we found it here. Thank you for your review Jodie. I'm glad that our property met your expectations and that you had a relaxing and peaceful stay in beautiful Hydeaway Bay. Stunning house with stunning outlook. Main en-suite shower needs hand held rose, orange pool sail needs to be removed in cooler months to allow more sun shine. Thank you for your review and suggestions towards making your stay more enjoyable. Hideaway Bay is a hidden treasure. Lorikeet Lodge is the perfect place to stay with views of the ocean and plenty of room for 6 people. Lovely balcony to watch the sun rise each morning. Comfortable accommodation and very clean. We all had an amazing stay. We were fortunate enough to find this beautiful property and stay for 3 nights. A complete home away from home with absolutely everything provided from coffee maker to chill out cd's. Spacious lounge, new kitchen, huge oven, 5 ring cooktop. Beautifully presented, stunning bathrooms, totally relaxing, a never want to leave it feel. Having done a lot of travelling there can't be anything out there that beats these views. 2 mins to the quiet, almost private beach. 5 mins to Dingo beach with good pub food and cafe. 5 mins to Cape Gloucester Resort for lunch and beach walks if you can tear yourself away. Caretaker close by for all your needs. Lovely peaceful area, perfect place to relax and do nothing and sleep like a baby. Cant wait to come back and stay longer. We would love to keep this 'find' a secret !! Thank you Karen for this lovely review. I am so happy that you enjoyed your stay and that the house was a comfortable a relaxing space for your break. Your feedback is very much appreciated and we would love to see you return for another stay.